The Snowjam 90cm Phenom Skiboards w. Your Own Snowboard bindings 2019. Super fun. You can now ride skiboards with snowboard boots! The Snowjam 90cm Phenom Skiboards w. Your Own Snowboard bindings 2019. Super fun. We have carried Snowjam since they first came out and are always impressed with their quality (over a decade now). These are truly very reliable, durable skiboards. Snowjam wood core twin tips are very easy to turn, spin, go backwards and even ride powder. These are also stable at speed due to their thick wood core. These 90cm skiboards are an easy way to perfect your skills on the slopes as well as being super fun, much more like skating on snow really. The twin-tip skiboards offer an extremely short learning curve, with the potential to ride anywhere you care to go. The 90cm size is perfect for those preferring greater control and maneuverability, but don’t want to compromise on quality and performance. With their wide body shape, these are great on the groomers, moguls, glades or even powder. They are super fun to ride off the back tails and for spinning and riding backwards. Snowjam 90cm Phenom Skiboards w. Your Own Snowboard bindings 2019. You can then use your own snowboard boots. 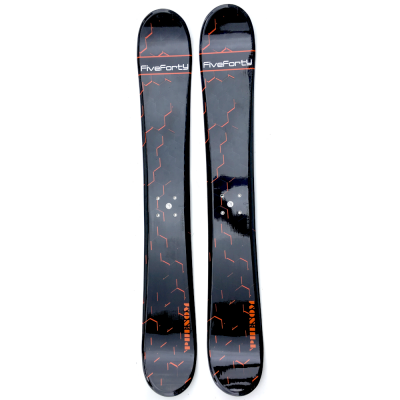 These skiboards also include the Snowboard Bindings Adaptor Kit. 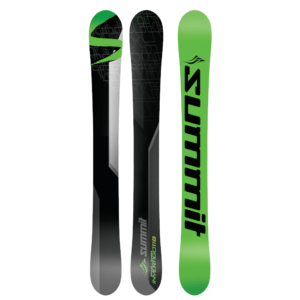 This kit includes Summit Snowboard Binding Riser Kit, Booster Straps and extra leashes as well as all hardware. Recommended for: beginners (who want to advance quickly), intermediate and even advanced riders who want to have fun with a skate-like feel. Excellent conversion for skaters. More questions about skiboards – visit our FAQ page. Wood Core: a tip-to-tail White Birch wood core provides stability and a highly responsive ride with the added benefit of skiboards that will last. Top Sheet: reverse printed, Dura Clear Polymide top sheet protects the boards from nicks and scratches. Fiberglass: bi-directional fiberglass construction for extra durability. 360 steel edges: full-wrapped, hardened steel edges so you can carve like mad. Bases: Stone ground P-tex 1850 semi-sintered bases – good wax absorption, highly durable and fast.